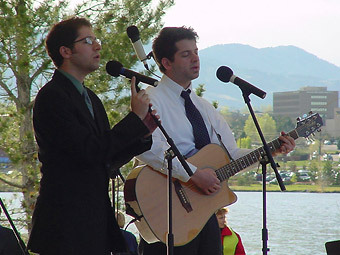 Steve and John Cohen sang their famous tune, "Friend of Mine" that brought tears tothe eyes of many. Their appearance was a rare surprise that reminded everyone why they were there. It was one of there best performances ever of the song that appears on the Lullaby for Columbine CD. Copyright © 2000 - 2004 The Lullaby for Columbine Project.